Hand painted Thanks card with embossed flower detail 10 cm x 15 cm with envelope. Hand-painted and hand-cut birthday card with envelope. Embossed flowery detail card, hand painted with inks onto high quality 300gsm watercolour paper and then secured onto a pearlised card base. 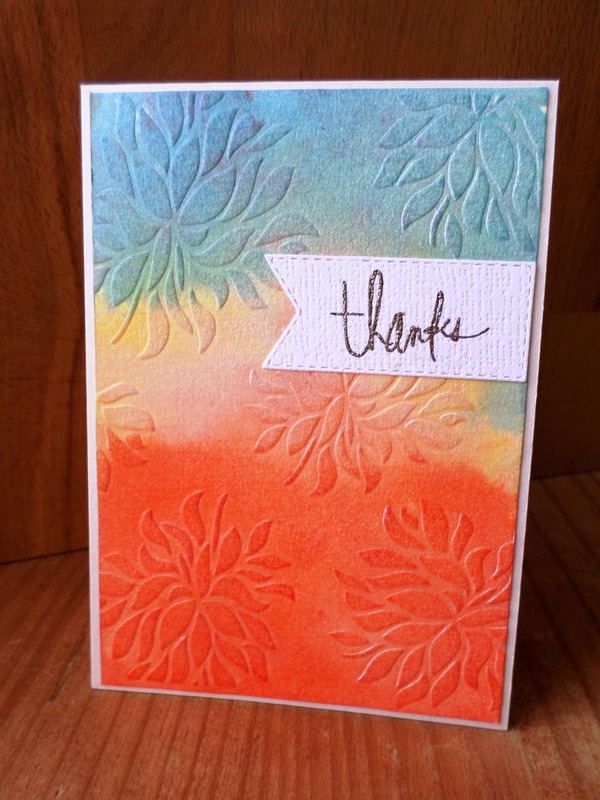 Heat embossed dark gold sentiment Thanks which stands out beautifully from the card. I make my cards with lots of care and attention to detail here in my little workshop - in the French countryside. Each card is designed, then hand-cut from high quality card stock and hand finished by me. This card includes a matching envelope and plastic protective pocket. Size 10 cm x 15 cm. Hand-cut 'Teacups' card 15cm x 15cm with envelope. Hand-cut 'Get Well Soon' card 12.5cm x 17cm with envelope. Hand-cut 'Get Well Soon' card 15cm x 15cm with envelope.